We choose to rent or own homes in particular suburbs because it’s close to where we work, it may have an exciting entertainment scene, or perhaps it’s in the right school zone for our children. But does that mean that you should invest in your own backyard, too? Make a distinction between where you live and where you should invest. 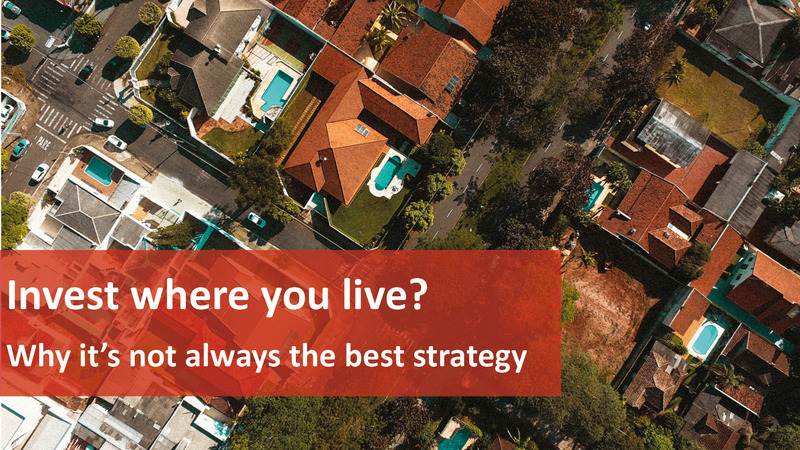 In many cases, where you want to live geographically and what type of property you want to live in may not be a great choice for a long-term investment property. That’s often because your home suburb has been chosen for emotional reasons and we all know that investing should be about using your head and not your heart. Strategic investors know to dig deeper than the average investor. They are always on the lookout for investment-grade properties that are going to outperform the averages – and that will probably mean investing in locations other than their home suburb. In fact, smart investors even look in other states when searching for their next property. Start with buying at the right stage of the property cycle. Look at the big picture – how the economy is performing and where we are in the property cycle. Look for the right state in which to invest – one that is poised for economic growth because this will lead to jobs growth, which leads to wages growth and population growth which eventually leads to property price growth. Within that state, look for the right suburb – one that has a long history of outperforming the averages and one will continue to do so because of its demographics. Hunt out affluent areas where the locals can afford to and are prepared to pay a premium to live there. These tend to be the established “money belt” inner and middle ring suburbs of our capital cities or suburbs that are gentrifying. And, sometimes, sophisticated investors’ investigations lead them to sitting on the sidelines and waiting, while other times they uncover signals that say to dive right in (while everyone else is pulling themselves out of the water). Hopefully by now you can see that investing in your own backyard is usually not the best investment strategy. That’s because there are many other locations across Australia that can provide investors with opportunities to buy property with better chances of achieving above average capital growth in the years ahead. While successful investing is all about strategy, it is also about considering all options and owning a geographically diverse portfolio so you can make the most of market “ups” and protect yourself during any “downs”. That way, market conditions are almost irrelevant because there is always somewhere in a country of our size where opportunities are ripe for investment picking.